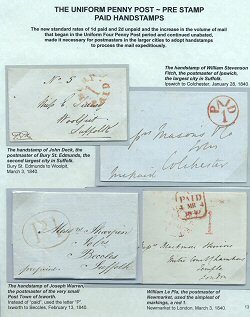 This display from Tom Slemons FRPSL covers the postmarks of Suffolk, rate markings, mail routes, and persons and places related to the postal history of the county up to the Uniform Penny Postage era. For many years, Tom, who is from middle America, lived and worked in the county and, obviously, has a great attachment resulting in a wide ranging postal history collection. Suffolk is one of the most difficult of counties to collect, and this is the definitive and thoroughly researched collection of this subject. The collection is the basis of the book Suffolk Postal History to 1844, published by the Rossiter Trust in 2017. This virtual display is organised in 3x4 frames as for the original display. "Returned from Ipswich" and "Returned from Woodbridge"
Ipswich "Too Late" and Stowmarket "Post Paid"